“Victorian parlour ladies” has become a derogatory phrase when it comes to describing the history of crafts. I wrote this some time ago for Love:Crochet. Crochet is not ‘my’ craft but it was interesting to look at its history, as it was so beloved of the “Victorian parlour ladies” of the 1840s and sheds some light on why, in the twentieth and twenty-first centuries, it became easy for some folk, taking their lead from historians, to be dismissive of the achievements and interests of nineteenth century women. Whenever I see that phrase “Victorian parlour ladies”, or – the contemporary equivalent “hobby” [knitters, spinners, weavers, insert craft here! ], I see a sexist attempt to belittle craftspeople. The whole idea of Victorian (female) dilettantes had its roots in the Victorian era itself. There is also a myth about the court of Queen Victoria dabbling in crafts when they were fashionable. In a future post, I hope to show how this is largely a fantasy. In fact, the Victorian age and the early twentieth century had many examples of middle class women (and men) reviving almost lost skills and using them to help working class people make a living. The most obvious example of this being William Morris’s revival of handspinning and weaving in Westmorland. Crafts were a part of the daily life of people of all social classes; for some, they might add a small but valuable income; for others, they didn’t just pass the time but also were a way of showing faith and virtue. Knitting and crochet were democratic. Why should the work of women of any social class be belittled or used to belittle contemporary craftspeople? Surviving textiles show the “parlour ladies” made beautiful things. Why wouldn’t they? They had the time. I think it was more complex than just conspicuous look-at-me-I-can-afford-to-spend-hours-crocheting-doilies-that-must-mean-I’m-RICH! I will look at this in more depth soon but for now, here is a piece inspired by William Etty’s painting ‘The Crochet Worker’. Mary Ann Purdon was the daughter of a Hull clerk; not a grand lady but typical of so many women who would have spent their spare time profitably. From an advertisement for ‘Guide to Knitting, Netting and Crochet’, Manchester Times, 1844. In the 1840s, the first written instructions for crochet appeared in print. In the same decade, William Etty painted this portrait of his great-niece, Mary Ann Purdon. The painting is often referred to as ‘Study’; a preliminary work for a painting that was never completed. The 1840s saw a craze for crochet, which had formerly been called ‘Shepherd’s Knitting’. This uncharacteristic, quiet painting, a study for ‘The Crochet Worker’, is undated but was probably painted in the late 1840s, towards the end of his life. Artist William Etty, R.A., (1787 – 1849) was infamous for painting nudes – not cosy domestic scenes. John Constable famously called Etty’s painting “Youth on the Prow, and Pleasure at the Helm”, “the bum-boat”. Wikipedia calls it “particularly gruesome”. (Unfairly – it’s a brilliant painting). Etty went from son of York gingerbread maker, to famous Royal Academician. His statue stands outside York Art Gallery, where in 2011-12, there was a popular exhibition of his work, ‘William Etty: Art and Controversy”. He was born one of ten children, to Matthew and Esther Etty. Only five of the young family made it to adulthood. Etty’s father rented a mill on the Mount, in York and ran a gingerbread shop on Feasegate. William’s earliest drawings were done in chalk or in the flour on the mill’s walls. Sometimes the gingerbread was gilded with elaborate designs. It is said some were done by Etty. At 14, William was apprenticed to a printer, and worked for seven years, as a compositor for ‘The Hull Packet’ newspaper, living with his master and his family in the backstreets of Hull. He hated every moment of it. During that time, one of William’s older brothers, Thomas went to sea, and came home one time with a box of watercolours for him. Etty decided to ask his wealthy uncle to fund his studies to be an artist in London, and although his uncle ignored his first begging later, caved in with the second. Etty arrived in London determined to become a painter, not a printer and in 1807 became a student at the Royal Academy. In his day, he was to become the most famous artist in England. This painting is often subtitled “Mary Ann Purdon, the artist’s niece”. Mary Ann was in fact, Etty’s great-niece, as she was the grand-daughter of his brother, John . John’s daughter, Catharine Etty married Robert Purdon at All Saints Pavement, York, in 1825. Mary Ann was born in Hull in 1832 – she had one older brother, Charles. Robert Purdon, was on the 1841 census as “clerk”. Victorians believed “The devil makes work for idle hands” and so manuals on virtue were published alongside the first crochet books. One title advertised alongside various Crochet and Knitting manuals in the 1840s, was the ‘Guide to Female Happiness Through the Paths of Virtue’. “Domestic amusement” – like crochet – was the way to avoid being sinful. ‘Mrs Griffiths’ in a foreword to ‘The Winchester fancy needlework instructor’ of 1847, said that at least needlewomen can “..feel the satisfaction of knowing that we are…innocently employed”. The Handbook stated that crochet was suited to shawls, table covers, pillows, mats, slippers, carriage mats, “and a great variety of other things of elegance and utility”. The Victorian female ideal combined usefulness with beauty. Crochet was possibly seen as more refined than knitting. Down the road from Mary Ann Purdon, working class women were busy knitting stockings and Humber fishermen’s ganseys for their families and maybe for sale. Crochet on the other hand, was seen as delicate and refined, and suited to the middle class lady who could spend her time usefully on “D’Oyleys” carriage mats or slippers. The writer, “Mrs Savage” suggested using “an ivory hook is most desirable. It is so light in use and becomes, in use, so glassy smooth, that it greatly facilitates the operation”. For the finest of work she preferred a steel hook. Etty died in 1849, when Mary Ann would have been only 17. In the Morning Post, May 13th, 1850, I found a poignant list of the items for sale from Etty’s studio, after he died. Amongst the works was ‘The Crochet Worker’, on sale for £48 and 6 shillings. It was listed under ‘Unfinished Paintings’ which suggests it really was one of his last works. And one of the most domestic and endearing. Only three years later, it was for sale again in the sale of “A series of Capital English Pictures”. This time, it went for ninety guineas, doubling its price. Mary Ann, and both her parents and brother, vanish from the censuses and eluded look ups in the marriage and death records. They are lost to us, for now, at least. She never owned the painting of herself. Looking down at her work, Mary Ann remains enigmatic. But this Hull lass must be one of the earliest English crochet workers recorded for posterity, at the height of the crochet craze. What an allegory of human life is Crochet! The village of Dębki in Poland, long had a myth about a British shipwreck and the survivors who came ashore – although the name of the ship was long forgotten. Dr Michal Wozniewski, interested to see if there was any truth in the Dębki folklore, found the remains of a wooden vessel on the sea floor, and alerted The Polish Maritime Museum in Gdansk, who catalogued the wreck as “W-32”. Local legend had long since forgotten the name of the vessel, so its identity was unknown. In the summer of 1995, the Museum anchored its own research vessel above W-32. Luckily, a recent storm had shifted a large amount of sand from the vessel, revealing its structure, and divers found the ship’s bell, which had the words GENERAL CARLETON OF WHITBY 1777 cast into it. The General Carleton was a comparatively new ship, built in 1777 by the same shipbuilder who built Captain Cook’s Endeavour. It had been a transport ship supporting the British in The Revolutionary Wars, evacuating the British troops from Savannah and Charleston; moving loyalist civilians to Jamaica. In 1785, it was back in port in London, or Hull, once more trading between Britain and the Baltic. Image: Courtesy Polish Maritime Museum Gdansk. Note jog where rounds join, and original knitter fudges repeats slightly! Baltic waters were treacherous, and the ship had to be guided by a pilot out into the open sea, where it was the following day, when a storm hit. Taking onboard water, The General Carleton began to list badly to one side, and so William Hustler made the decision to sail for the safety of Danzig (Gdansk) Bay, and take shelter til the storm passed. It was not Danzig, but the nearby fishing village of Dębki where the ship foundered on a sand bank. Over 775 artefacts were raised, and preserved by The Polish Maritime Museum in an excavation led by Dr Waldemar Ossowski. Many of these were knitted items of clothing; some possibly manufactured in the Baltic, but most no doubt from Yorkshire. 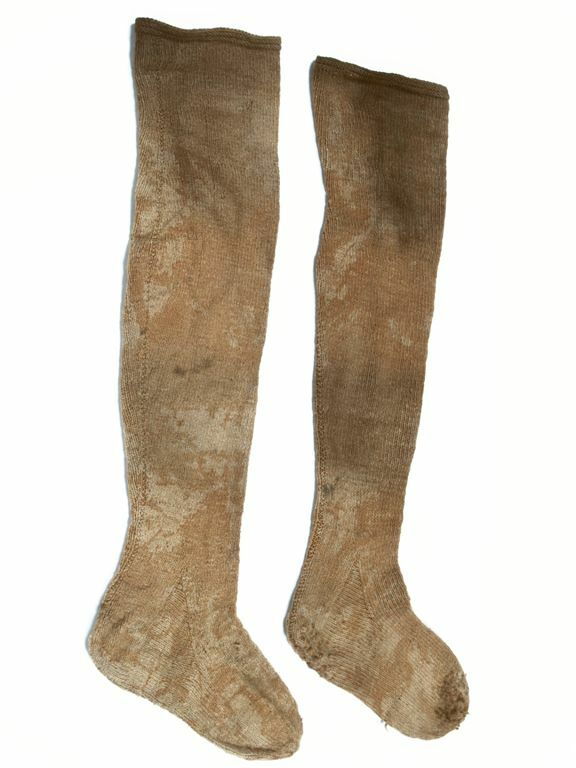 Stockings from the wreck. Most likely knitted in Yorkshire, c. 1780. Image courtesy Polish Maritime Museum, Gdansk. On the ship’s port side, the barrels of Swedish pine tar that were cargo, had been smashed up and the tar had formed a matrix with the sand and water, that preserved the artefacts it covered. Amongst these rare survivals, many items of clothing and even paper, survived. 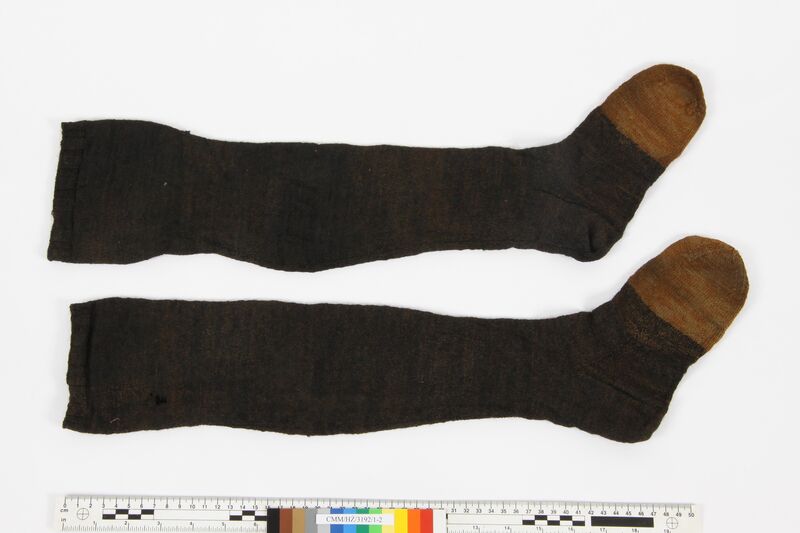 Items of clothing included sailors’ jackets, waistcoats, shoes, stockings and hats. This was not a Royal Navy vessel, but an armed merchantman. The mariners would be wearing clothes they had bought themselves. Miraculously, some survived on the sea-bed still neatly folded, although the ‘slop chests’ they had been stored in, had rotted away around them. “Slops” was the generic name for “sailors’ clothing”. At this date, Whitby had six slop shops. Sir Frederick Morton Eden in ‘State of the Poor’ wrote “…. almost every article of dress worn by farmers, mechanics and labourers, is manufactured at home…” In Yorkshire at this date, both the Great Wheel and the smaller treadle spinning wheel were in use – the former mainly for wool and semi-worsted; the latter for flax. 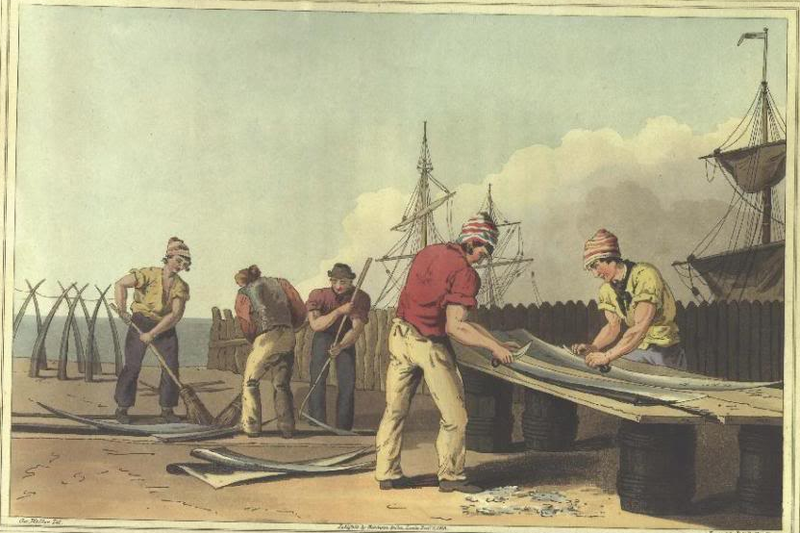 Whitby was known for its woven ‘stuff’ – a cheap fabric made from a combed wool warp and weft. It’s worth saying at this point, not a single sailor’s ‘gansey’ or knit frock was found in the wreck. Not one. At these dates, sailors wore a woven woollen jacket called a “Fearnought”. If you want to read more about the knitted items from The General Carleton, there’s a link to the magazine where the original article appeared, below. Stephen Baines’ book, ‘The Yorkshire “Mary Rose”‘ (2010) is well worth a read. Also available “The General Carleton Shipwreck, 1785/ Wrak Statku General Carleton, 1785”. (2008). Waldemar Ossowski (ed). Pub CMM, Gdańsk. The General Carleton cap pattern is available in ’10 Best Patterns from Piecework’s Historical Knitting Collection‘, but is also available as a separate download, here. It originally appeared in Piecework, Jan/Feb 2014, which is still available digitally or in hard copy. Thanks are due to Elżbieta Wróblewska at the Polish Maritime Museum, whose help was invaluable. 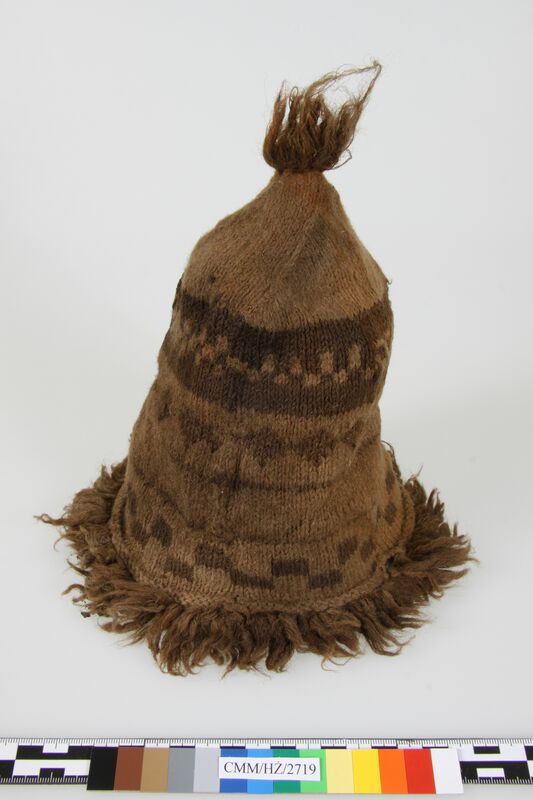 Also the kind folk at Captain Cook Memorial Museum in Whitby, and thanks also to Carol Kocian and Stephen Baines, whose scholarship and research made my own reconstruction of the Carleton cap, possible. General Carleton hat. From a Whitby ship wrecked in the Baltic, in 1780. The General Carleton hat has just been republished in Interweave’s ’10 Best Patterns from Piecework’s Historical Knitting Collection’. I’m hearing from museum historical interpreters, and living historians all over, that they have made this hat. Canadians love it for some reason! It has a certain crazy charm to it. If you can’t find the yarn (Rowan Tweed Aran, now discontinued), use Ravelry’s Yarn tab to find a similar weight alternative. Rowan Tweed was a singles, but it would be fine knitted with a plied yarn, too, so long as it is Aran weight. Hand-spinners can approximate the yarn by spinning an Aran grist singles. The original hat had more stitches than the published pattern, and was from a slightly finer grist yarn; something between a DK and an Aran. 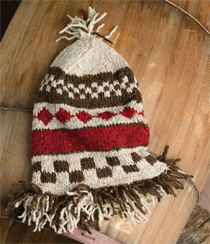 I decided to write the pattern for a commercially available yarn to make it accessible to knitters but at some point, I hope to publish a stitch-by-stitch repro of the original hat. I saw it on display at The Captain Cook Memorial Museum in Whitby when it was on loan from Gdansk Maritime Museum. The colours are putative but appear to be a light and a dark natural, plus one other colour that may have been an orangey red. Dyers can reproduce this with a slightly-too-hot madder dyebath, or coreopsis. Onion skins have been suggested as a possible dye-stuff, and with alum would give a reasonable colour but I think the wool at these dates would be more likely to have been dyed with a professional dye – like madder. The bands of colour in the Whalebone Scrapers picture, certainly appear to show a vivid orange colour. And the fact three men are wearing it suggests it was possibly seen as a bit of occupational clothing, in Yorkshire at least. Walker’s engraving was made 30 years after ‘The General Carleton’ was lost.